The Fusheng A series water-cooling reciprocating air compressor is designed for general industry use. Its standard operating pressure falls between 7 and 12 kg/cm2G and is suited for applications requiring variable high efficiency piston displacement volumes. The A series compressor runs from 0.37kW (½hp) to 15kW (20hp) and is designed for heavy-duty applications, low speed operation, and prolonged use. It is equipped with a fully-automatic and semi-automatic control for greater energy efficiency during loading/unloading or shut-down. It is suitable for use in industries involving automobile maintenance, paint and sprays, materials production, textile, and tires. The Fusheng A series air compressor has a wide scope of applications and can be customized into a 2-stage or 3-stage compression with operating pressures ranging from 18 kg/cm2G to 35 kg/cm2G. The suction/discharge valves are made of a special Swedish steel that carries essential properties such as impact resistance and a high tolerance for high-temperature operations. 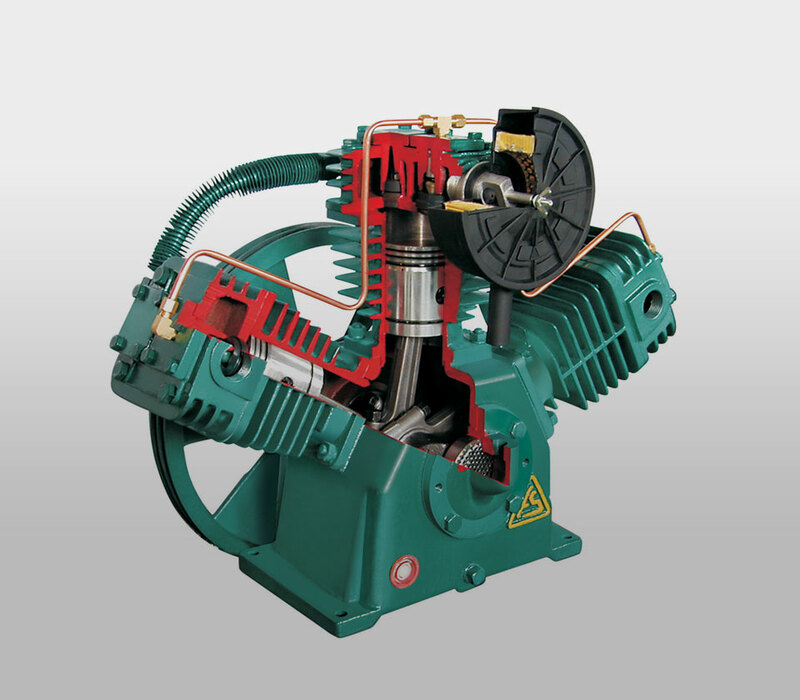 The cylinders, connecting rods, and piston rings are produced and ground by precision machines, allowing the A series compressor to offer excellent airtightness and low friction. All these features, including a high-precision crankshaft and crankcase, allow for balanced compressor operations with low vibration and high output volume. The Fusheng A series is verified by TUV Rheinland, a third-party testing laboratory. The design of the compressed air system is based on the five elements (the 5 S’s) that we want our products to provide for the customers - security protection (Safety), ease of Service (Service), stability and reliability (Stable), the international certification (Specification - compliant) and Energy Saving (Cost Saving). All crankshafts are forged with excellent steel material and their surfaces are reinforced with treatment for superior wear resistance. In addition, balance blocks are used to reduce vibrations when in operation. The compressor ring and oil-control ring undergo precision processing ensure tight sealing and low oil-consumption, resulting in low carbon deposits at the valve bank and allowing easy maintenance. The use of suction / discharge valves made of Swedish steel can neutralize the stress of precision turning and grinding, enhancing shock endurance, temperature tolerance, and toughness. The inside of the cylinders are processed with CNC precision, which ensures excellent seal fitting and a low coefficient of friction, reducing compressor leakage and power consumption. High-efficiency heat radiating fins and a cooling copper tube design can reduce the temperature of the compressed air and enhance the efficiency of the compressor. Cylinder Heads - Deep directional fins provide quick cooling; compact streamlined air passages in the cylinder head permit fast and efficient flow of cooler intake air and rapid removal of discharge air. Crankcase – The extra-large crankcase with a big oil reservoir ensures cooler running and better lubrication. Connecting Rods- All units feature a precise bore and industrial-quality connecting rods with a splash lubrication. Suction strainer – The permanent type strainer effectively filters air and muffles air intake noise. It can be easily removed for periodic cleaning. Main bearings – To ensure a long service life and easy maintenance, high quality ball bearings or tapered roller bearings are used in the Fusheng compressors.